The references to "Schomacher" and "Schumacher" in this review are actually misspellings of Harry Shoemaker's name. The original scans for these articles come from the California Digital Newspaper Collection. I stood this afternoon in the little sound-proof receiving booth in the telegraph station on Catalina, and heard the snapping, cracking, spitting sound of the 110-volt current of electricity passing between the poles of the big wireless telegraph machine at White's point, near San Pedro. The little booth is not more that four by four feet square and seven feet high, but it serves its purpose. The operator, W. R. Carroll, with adrophones attached to both ears took a message from The Herald's representative at the mainland station. Just outside the door stood Gen. A. L. New, who has worked harder during the past six weeks to perfect this system than he ever worked in his life before, according to his own account. Chief Electrician R. H. Marriott, late of Philadelphia, also anxiously watched the receiving of the first through message from the mainland, and when the signature was finished every member of the small party gave a sigh of satisfaction at having been present at the receiving of the first press message sent from the mainland to Catalina. In a few minutes the engine in the dynamo room was in operation and Operator Carroll, who has sent many a wireless message between the islands of the Hawaiian group, was calling White's point. The answering call came back, and The Herald's message was flashed across the sea, the first press message ever received in America by wireless telegraphy. 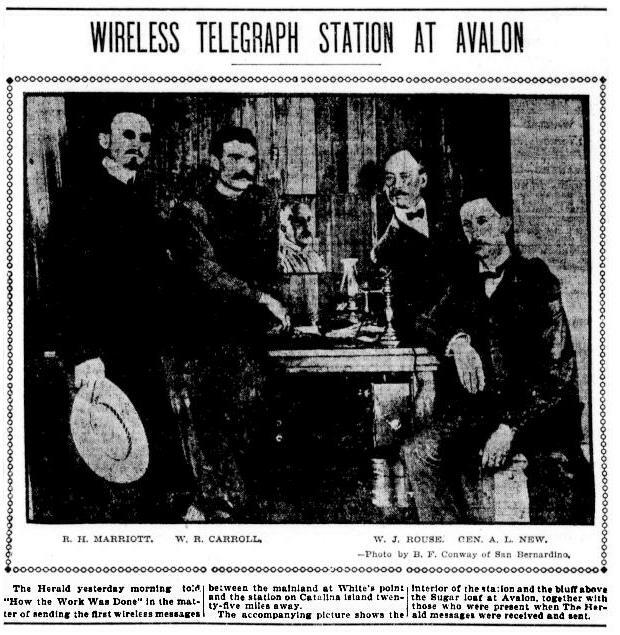 The Pacific Wireless Telegraph company opened its system of communication between Avalon and San Pedro yesterday, the first commercial message being sent from the San Pedro station at 1 o'clock in the afternoon. The San Pedro station was in charge of G. Swenson and Fred New, the son of General New, while the Catalina station was in charge of Chief Electrician R. H. Marriott and Western Union Operator Carroll. Sawyer of The Herald is here. Time, 1.10 p. m. Code, Morse. Words, 6. The message was repeated several times and in less than five minutes after the motor was stopped to allow the receiving apparatus to work the answer began to arrive. It was: "Have no message for Sawyer," followed by dots and dashes that could not be made to mean anything. "Rip and roast the Times for us." SAN PEDRO STATION. Aug:. 2, 1900. Time, 2 p. m. Code, Morse. Words, 2. SAN PEDRO STATION, Aug. 2, 1902. Greetings from the mainland to Catalina. Herald congratulates Catalina on success of new system of wireless communication with the mainland. Time, 2:15. Code, Morse. Words, 20. AVALON STATION, Aug. 2. 1902. Catalina sends greetings to the mainland. Come over and get in the swim and cool off. Received at 2:45 p. m.
Send today's news from Avalon. Time, 2:50 p.m. Code, Morse. Words, 10. AVALON STATION, Aug. 2, 1908. Greeting. Got it O. K. Will send news at four. Hermosa leaves port now. Answer in ten minutes. Received at 3:17 p. m.
No. 5. San Pedro Station, Aug. 2, 1902. Pshaw, I will miss the train and have to walk to Long Beach and take electric car. Time, 3:27 p.m. Code, Morse. Words, 20. Success of Hunters No. 4. Avalon Station, Aug. 2. Don't miss train. Will wire tonight Metropole arrivals. 9 o'clock. Arrange to have forwarded to Herald. Lloyd Macy and Roy Macomber of Pasadena brought in six goats this afternoon at 4 o'clock. Killed fifteen miles down the island. HERALD. Received at 4 p. m.
This message contained fifty-three words, and the sentence "don't miss the train" was repeated four times while the rest was repeated twice. As soon as it was received and written the answer was sent. No. 6. San Pedro Station, Aug. 2. Must leave now to catch train. Will have other messages forwarded. Received news O. K.
Time, 4:45 p.m. Code, Morse. Words, 14. The correspondent then started for San Pedro and as he left the station the receiver had already begun to tick off another message. The time occupied in sending six and receiving four messages was three hours and fifty minutes. There were 173 words transmitted and all but one of the messages were repeated several times. (By Wireless Telegraph.) AVALON, Aug. 2.--Arrivals at Hotel Metropole, 9 p. m.: Arthur Cowan, Los Angeles; George P. Baldwin, Los Angeles; J. B. Taylor, M. Goldsmith, Stockton; M. W. Robin. Grand display on arrival of Hermosa. High up on the hill to the north of Avalon, 220 feet above the level of the verandas of the Metropole hotel, is the Catalina island station of the Pacific Wireless Telephone and Telegraph company. It is not an imposing building and the exterior conveys no idea of its importance to the island. Rectangular in shape and about the size of the small cottages which line the beach is the home of the machinery which has cost the company thousands of dollars to perfect and put in condition for commercial use. Standing near the station on the hill is a mast 160 feet high and suspended from an arm at the top is a wire about a half inch in diameter. Down in the station it is connected with plates and dynamos, where a current of 110 volts is generated, which passes through an induction coil of 120 miles of silk-bound wire which is, including the silken cover, no thicker than the heavy thread which is used in sewing together strips of carpet. Through the induction coil the alternating current runs up and down the wire suspended from the top of the mast. Ether waves surround the wire, and for all that surround the whole world, according to the theories of the electrical wizards who discovered them and found out that they would carry electrical impressions. To these waves the wire transmits the alternating impressions. Inside the office and in front of a table on which is arranged a series of switches which control the machinery and a telegraph key sits an operator who "makes and breaks circuit," as the technical terms go, and these "breaks and makes" are communicated to the ether waves by the vertical wire and the dot and dash connections in the circuit breaker indicating the letters of the alphabet, and go through, along with or on the ether waves to other stations. Off to the north of Avalon, and across the channel which separates Catalina from the mainland, twenty-four miles from the island and two miles north and west of San Pedro is White's point. On this point, which is the second from the San Pedro lighthouse, is the mainland station of the Wireless company. One hundred and twenty feet above the little pavilion on the stone pier which serves as a wharf for the fishermen who go out from the cove for abalones, stands the mast, which rises 160 feet above the elevation of the bluff. From the top, which is 285 feet above the level of the sea, is suspended a piece of the same wire which hangs from the head of the mast at the Avalon station. Down in the station it is connected with machinery similar to that in the Catalina station and at the instruments which are arranged to receive messages as soon as a message has been transmitted, sits an operator, who records the dots and dashes which are made by the operator sending the message from the Avalon station. A typewriter rattles off the letters as they are ticked off the receivers. Back from White's point comes the answer over the ether waves and the operator at Avalon takes down the short and long circuit breaks on his typewriter and the messenger carries the message down from the hill station to the hotel. Even the waters of the ocean are harnessed to the wireless system. From the plates at each station wires are run down and connected with the water, and through the ocean comes the return current which completes the circuit between the stations. The Pacific Wireless Telephone and Telegraph company has the Pacific coast rights to the patents of the American Wireless Telegraph company, which cover the machinery used in the system. The apparatus is the result of a series of discoveries and inventors which were started by Professor Dolbear of Tufts college. After several years of elaborate and careful work he attained some success, but only succeeded far enough to confirm his theory and show that it was possible to send electrical impressions through space. Professor Dolbear's discoveries and inventions with wireless telegraphy are similar to those of Bell with the telephone, and it was not until he work was taken up by Professor Collins, who made some advances and succeeded in overcoming some of the mechanical difficulties, that the wireless system had the appearance of becoming a reality and capable of being used for commercial purposes. There were still defects in the working of the machinery developed by Professor Collins which prevented the system from working with complete success and accurately conveying messages between stations. Professor Schomacher then began his experiments and carried them to a point where success was complete and insured a system which would work accurately and convey the dot and dash impressions of the telegraphic code. His work in connection with that of Professor Collins is similar to that of Edison in perfecting the telephone. 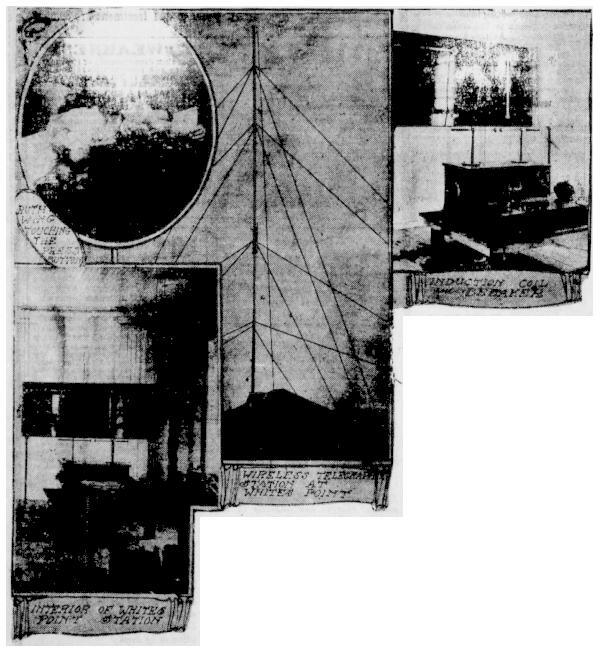 The wireless telegraph system, as developed by Professor Dolbear, Collins and Schumacher was patented and taken under the control of the American Wireless Telegraph company and the rights to use the patents on the Pacific coast were secured by the Pacific Wireless Telegraph company in 1901. When the Pacific company secured, the rights to the patents the system was beyond the experimental stage and the practical working of the machinery had been tested during the yacht races, when accurate dispatches were received from the boats which were following the racers, but there were still details in the mechanical construction of the machinery which could be improved on even if the system worked perfectly, and to make these improvements the Pacific company established in Denver during the early part of June of last year machine shops on Court street, between Fifteenth and Sixteenth, where a series of experiments were made with a view of simplifying and adding to the machinery, where it would be possible. For this work a regular force of ten expert electricians, and at times five or six additional men was employed by the company, and as these men studied the mechanism and working of the system minor changes in the machinery and application of the electrical current were made, and with these improvements the company began building the machinery which is now in use at the Avalon and White's point stations. Work was started on the island station about May 15 of this year and soon, after the mainland station was commenced, but the work at White's point was pushed more rapidly and there was a better working ground and not so many difficulties in securing working material, so the mainland nation was completed first. The machinery was in working order before that at Avalon was in place and was given a thorough test. There have been some delays in getting everything working in the best shape, but all difficulties have been met and conquered. The first call from Avalon to the mainland was made several weeks ago by Ruth Wing, daughter of W. E. Wing, of Los Angeles. For some time it has been possible to raise the mainland from the island, but the worst trouble was in getting return messages from the mainland to the island. The photograph shows Ruth Wing making the first call to Avalon. Nestling in her little niche, engirt with hills and met by the gentle swish-swish of the tiny waves of the most beautiful bay in the world, Avalon, the magic isle, the mecca of the pleasure seeker, has bounded into a prominence which will reach to the furthermost confines of this continent and the old world, by Saturday's successful demonstration of the practical use of the wireless telegraphy, contained in dispatches sent by that method to The Herald in the six hours that elapsed after the last boat had left for the mainland, which meant the departure of the only means of communication with the outside world. General A. L. New, general manager of the Pacific Wireless Telephone and Telegraph company, demonstrated by the sending of items of news to The Herald on Saturday evening, until almost 10 o'clock, that the wireless telegraph station on the bluff above "sugar loaf" is a success. For some days messages had been sent and received between the little station on the hill and White's point, near San Pedro, but it was not until Saturday that all conditions seemed favorable for opening the station to the press, and The Herald was invited to send the first message to be tapped off for public dissemination on Saturday afternoon, and W. J. Rouse, assistant general manager of The Herald, climbed the hill with General New and his chief engineer, R. H. Marriott, at 2 o'clock, with the little slip of white paper in his hand which bore the words of greeting. It was filed as is the ordinary telegraph message and in a moment's time the operator, W. R. Carroll, was converting the letters into the dots and dashes of the Morse telegraph code, announced in a series of loud explosions, which emitted flashes between the two terminals, indicating by sight as well as sound, the durations of each. The message was received without a break at White's point and soon an answer was received from the operator at that end of the line. And so the first press message west of the Atlantic coast was sent by wireless telegraphy. The distinction of being the first woman in the country and perhaps in the world to send a news dispatch by wireless telegraphy, belongs to a member of The Herald's regular staff, Mrs. Elva E. Day, who is the correspondent at Avalon. Mrs. Day was at the station at 4 o'clock on Saturday afternoon, almost an hour after the last boat had left for the mainland, when two hunters, Lloyd Macey and Roy Macomber of Pasadena, came over the mountain with the skins and heads of half a dozen goats hung to their saddles. The story of the killing was immediately filed with the operator and dispatched to The Herald editorial rooms in Los Angeles, and was followed by the sending of the arrivals at the Hotel Metropole, more than five hours later and six hours after the last boat had departed from the wharf. While no attempt has been made to send messages any further than to White's point, it is only a matter of a short time when instruments will be set up in other places. The apparatus now working is believed to carry a voltage sufficient to send messages to a very much greater distance. The wire running to the 152 foot mast, from which the messages are cast to the electro-etheric waves for transmission to any other open machine within its distance, carries a voltage of 600,000. So strong is it that even the guy ropes that hold the mast in place are so charged that on Saturday afternoon Engineer Marriott demonstrated the possibility of receiving from them a message in transmission. So powerful is it that the kind of rubber used on the trolley wires of street car lines is too soft, and it has been found necessary at the Avalon station to use very hard rubber, glass or porcelain, the voltage being so high that it breaks down the ordinary insulator. The possibilities opened up by the use of the wireless telegraph are almost beyond contemplation, but it is safe to predict that beyond its value to the commercial world. In a very short time to come, it will develop that people traveling into the wilderness of land or sea will take with them this instrument of communication with the world they have left behind, notwithstanding that the mountains may be as high as the Himalayas or the seas as boundless as the broad Pacific.